With Wookie’s debut release, ‘Battle’, and his underground track ‘Scrappy’, plus his remix of Sia’s ‘Little Man’, Wookie quickly emerged as one of the key players in the UK Garage scene. So it’s no surprise that the current resurgence in bass-lead, funk inflected tracks has found the East London resident being name-checked by the likes of Disclosure and Rudimental. Wookie’s production CV reads like a who’s who of R&B infused hit records having produced and remixed the likes of Jessie J, Rizzle Kicks, Sia, Justin Timberlake, Roll Deep and Ray Foxx. 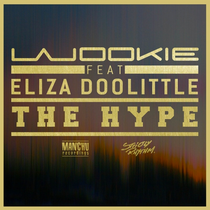 Wookie’s latest single, ‘The Hype’, is an infectious contemporary house track featuring the vocals and writing talents of Eliza Doolittle, who most recently assaulted the airwaves and charts with her Disclosure collaboration ‘You & Me’. As Radio 1 and 1Xtra DJ MistaJam says, “Wookie is so back on form, it's like he never left. ‘The Hype’ oozes class." Check it out below, it’s out on the very cool Strictly Rhythm Records.